On Thames Street, facing the river, is the Parish Church, St. Mary’s, and by its side the Bell Inn. The Bell Inn is a long established part of Hampton’s history, already in existence in 1557 when its owner, Robert Hammond, bequeathed an acre of land and the income from the inn to fund a free school in Hampton, the forerunner of today’s Hampton School. 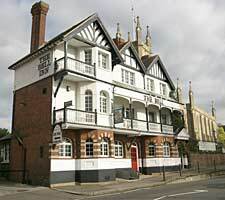 The old hotel was burned down in 1892 and soon replaced by the Bell Inn of today. The Inn gives its name to the sloping stretch of land across the busy A308 that leads down to the river – Bell Hill. For the thousand years of Hampton’s existence on its present site this is where boats and barges have moored to load and to unload. Hampton Hard, as this part of the riverside is known, is so named because it provides hard standing for boats. One of the few areas in this part of the Thames where boats could be taken out of the water. The area was not large enough for the extra traffic that was a result of the rebuilding of St Mary’s Church in 1831 so a temporary jetty was built. 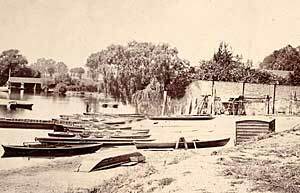 A very early photograph shows a primitive boat shed near to the Hard and several rowing boats for hire. It wasn’t until 1863 that Bell Hill was fenced off to become ‘The Prince’s Garden’ in celebration of the marriage of the Prince of Wales (later King Edward VII) to Princess Alexandra. There was beef and beer for the adults and pork pie and plum cake for the children – with a tightrope walker making his way across the river. But by the 1880s the Prince’s Garden had been allowed to decay into a ‘most deplorable condition’. In 1884 the Rural Sanitary Authority redeveloped the area into the ‘recreation ground’ that can still be seen today, with its upper promenade, flower beds and benches to sit on and stroll and enjoy the river – and band concerts, ‘aquatic sports’ and regattas. 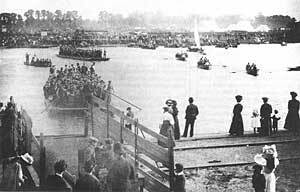 In 1910 a proper landing stage was built at the foot of Bell Hill to allow steam launches as well as barges to land. All this while the Hampton Ferry has been plying its trade between Bell Hill and Molesey Hurst on the Surrey bank. No one knows the origin of the ferry though it was certainly in existence by 1519 when Cardinal Wolsey had taken over the lease of Hampton Court. There were extensive building works in the area at that time that were continued by Henry VIII when he ‘acquired’ the Palace in 1529. 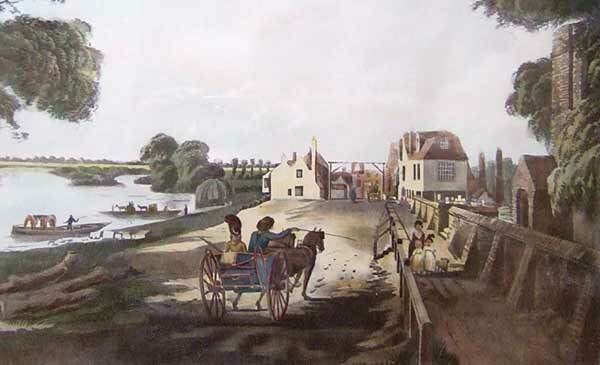 The Ferry was particularly popular during the days of the Hampton Races on Molesey Hurst in June and September in the nineteenth century, as they had been in the earlier days of (illegal) prize fighting when equally large crowds were crossing the river by ferry. Some residents may remember the days of George and Betty Kenton who operated the ferry for many years. The present ferry has been run by its leaseholders, Dave and Sue Bedford since August 1996. But the Bell Hill ‘recreation ground’ has, sadly, decayed in recent years, like its predecessor ‘The Prince’s Gardens’ and is sadly in need of some TLC – which at the time of writing the Hampton Riverside Trust and the Council are planning to provide. Above Bell Hill, however, is St Mary’s Parish Church, which has existed, in one form or another, certainly since records began in 1342 and probably as a place of worship before that. The old fourteenth century church was demolished in 1829 and rebuilt in 1830/31. It has an interior of great beauty and interest – which is the subject of another chapter of our Internet Publication. Today Thames Street is part of the busy A308 trunk road between Kingston upon Thames and Sunbury on Thames.